I think I have a new favourite holiday! Dressing up together as a family, it doesn't really get much more fun than this. 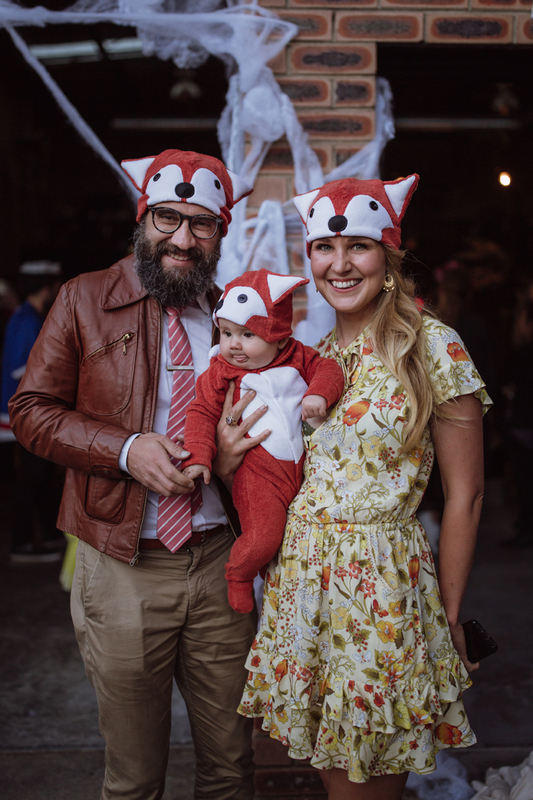 The Helloween Party invite kind of hit us by surprise though and I had no time to craft creative costumes, but I was pleased with our last minute "Fantastic Mr Fox" Family outfits, they were comfy too, especially important for little Faye. I am already looking forward to making costumes for the years to come. The yearly Hello May Party was, as usual, one great night. Faye was quite the party animal in the beginning and then just slept in the sling for the rest of the night. 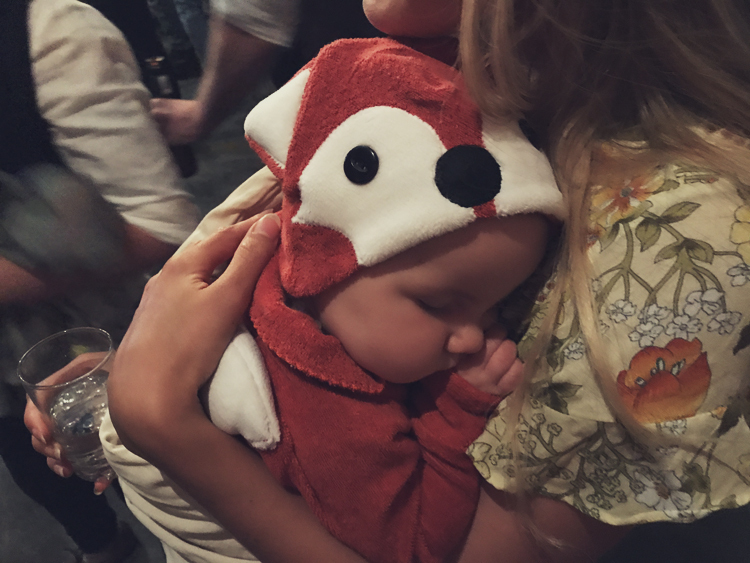 I might have put her to bed in her fox onesie that night, as I couldn't stand the thought of waking her. I also got to wear my extra sparkly vegan eco-fashion shoes, which are a little bit amazing. 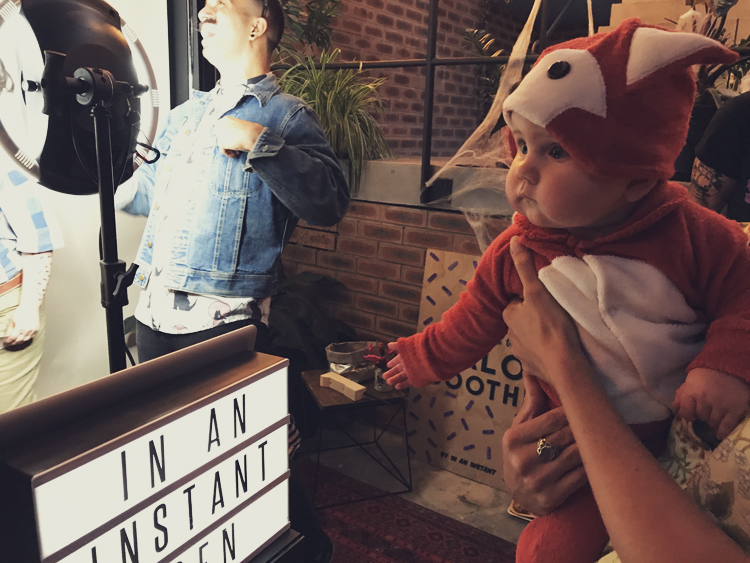 So much so that they deserve a little special mention here on the blog. The Goodall Sandals by Nicora are the perfect chic flats. Handmade in L.A. by the most skilled craftsmen, the materials are all cleverly recycled too. Goodall Sandal is also available in Black (recycled X-Ray film), Brown (recycled Beer bottles) and Red (recycled Tomato Sauce bottles) !!!! They look and feel extremely luxurious. Possibly the best-made shoes I have owned!? Did I already mention how comfortable they are? I wish I could wear them every day. So I will possibly get myself one of the more daytime/casual looking designs as well. 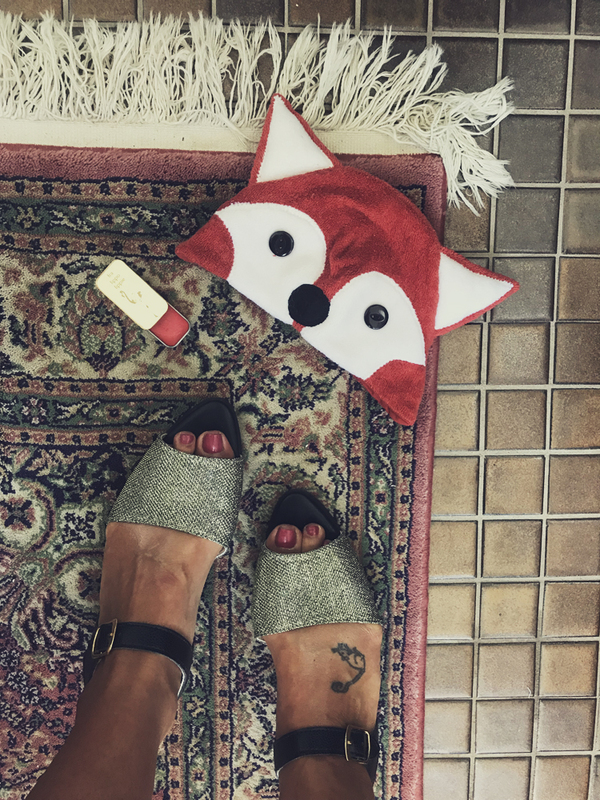 I am not even sure if any pictures do these beauties justice, but if you are looking for some really great shoes that are also eco, sustainable, ethical & vegan get yourself some NICORA shoes. I also love how timeless all their styles are, such a good investment. On my nails I am wearing Sienna Byron Bay "Muse" and on my lips is "Rebel Rebel" by Fra Lippo Lippie.